My Quick Review: It’s tough to be too negative with a movie that shows a lot of heart and is trying something new with the genre. With that being said it’s also hard to recommend a movie that should have been a short segment in an anthology and that is stretched way past the point of boredom. The Last Will is all atmosphere and rests on the shoulder of his main character, perfectly played by Aaron Poole and voiced by Vanessa Redgrave. This is a movie about loneliness and fanatic religion and as such it works and makes you think. That is, if you can stay awake and get involved with the story. Because if you’re looking for genuine scares, you might have already turned off your screen before anything really exciting happens. Rodrigo Gudino (founder of Rue Morgue) shows talent behind the camera but The Last Will should have been another short of his since it does not have enough meat to sustain a full length feature. 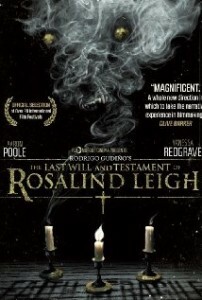 Click Here if you want to Watch The Last Will of Rosalind Leigh Online Now! Not gonna lie; I watched this one for Vanessa, but I, too, give them props for trying. The creepy atmosphere rather than straight up horror was a nice change from the typical. Thanks for the review!